Ngoc Lan was one of those people that if she didn't have anything nice to say about someone, she wouldn't say anything at all. During the time I knew her, we rarely spoke about other singers. I do recall only one occasion while she was driving me around to look for costumes for our video shoot that I just flat out asked her at point blank just who was her favorite singer. She hesitated a bit to answer and then she said, "I think Kieu Nga sings really well." And then I asked her, " Well, who was the singer that had inspired you? Who was your idol growing up and before you became a singer?" She paused for a bit. Then she uttered, "Thanh Lan". Of course, I had to put my two cents in and tell her how much I had also idolized Khanh Ha and Julie Quang, in addition to her. I asked her what she thought of them. All she said was that she liked them, especially Julie Quang whenever she sang in French. Being the nosy person I am, I had really wanted to ask her which singers did she not particularly care for. But I didn't dare go there. 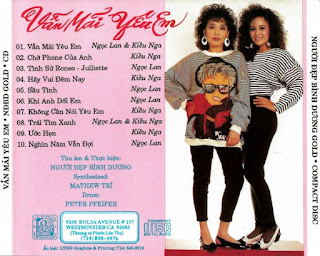 When I asked Ngoc Lan who was her favorite Vietnamese male singer, she readily answered that it was Duy Quang. I then told her I liked Duy Quang's voice, as well. And then she said something to the effect that all singers are great in their own distinct way. I could tell this was her way of closing out the conversation and hinting to me that we should move on to another subject. Somehow I had gotten the feeling that she didn't like to be asked such questions. I think perhaps she might have been concerned that if she were to disclose who she did and didn't like among Vietnamese singers, the word just might get out which might bring about tensions between some of her colleagues and herself. I'd have to say that that was a quality I really admired in Ngoc Lan. She was obviously smart enough to realize that in the world of showbiz what you say can easily get misconstrued and end up biting you in the back. From that day on, I never asked her about what she thought of other singers ever again. I did pay attention to one other thing during the times I had spent with her. And that was, who she would listen to while she was driving me around, which cassettes were in her selection kept in her car. Most of the time she would be listening to songs that she was in the process of rehearsing and about to go into the studio to record. A few times I heard her listening to Olivia Newton-John. And other times, she would play Elsa Lughini. 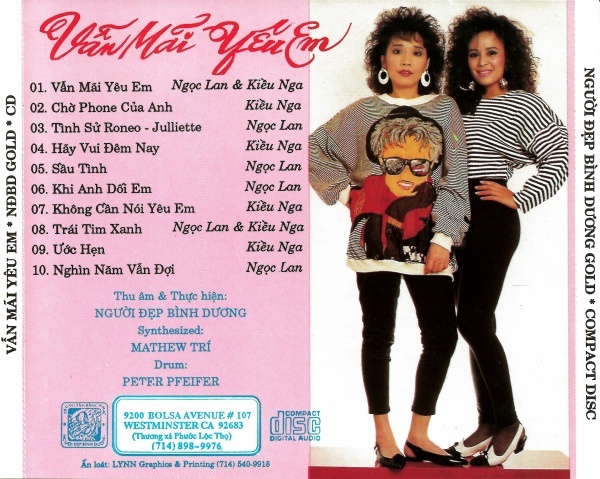 As for Vietnamese singers, I remember listening to one or two cassettes of Kieu Nga. And there was one occasion when she made me listen to Nhat Truong and Thanh Lan on an old cassette recorded way back in Saigon prior to 1975 during the entire drive. She kept playing over and over again, Nguoi O Lai Charlie and Mua Dong Cua Anh. I do like Thanh Lan's voice. But as far as Nhat Truong and his music, just imagine how I felt listening to it considering how I was a kid who had grown up in the United States and was then just familiarizing myself with Vietnamese music. Nhat Truong's music is anything but even remotely close to that of American pop music. A few months later, I finally figured out the reason why she had me listen to those two songs over and over that one day when I saw that Ngoc Lan and Duy Quang had just released another duet album which included their version of Mua Dong Cua Anh and again, on some compilation cassette of various artists produced by Lang Van that included their duet version of Nguoi O Lai Charlie. It just goes to show how much of a hard worker Ngoc Lan was. Even when driving around, rather than listen to music as a way to relax, Ngoc Lan was actually listening with her work in mind.